Seven North County museums will work together to produce the first-ever North County Arts & Culture in June event. The collaboration means that visitors to these museums in June will receive half-off admission prices, as well as several special events. The museums are the California Center for the Arts, Escondido Museum in Escondido, California Surf Museum in Oceanside, Lux Art Institute in Encinitas, Museum of Making Music in Carlsbad, the Oceanside Museum of Art, the San Diego Botanic Garden in Encinitas and the San Diego Children’s Discovery Museum, formerly known as the Escondido Children’s Museum. The public can secure a free passport atwww.northcountyartsandculture.org, then present it at any of the museums to get half-price admission for as many as four people. The passport is good for one visit to each museum during the month. Grace Madamba of the Lux Art Institute in Encinitas, and one of the June event’s co-organizers, said the idea sprang from the popularity of the countywide museum month that happens each February. More on the story here at the North County Times. Be aware, there have been two burglaries in the Fire Mountain neighborhood one on Fuchsia Court, the other on Fire Mountain Road. Accounts of the robberies were given by neighbors and victims: In the cul de sac on Fuchsia Court, off Ivy Road, two girls came to the door and rang the bell. When no one answered, they went around to the back of the house and broke in. The girls had backpacks to carry out what they stole and they were in a silver Suzuki. The neighbor saw the girls and got the license plate number of the car — the stolen property was dropped as they fled and the items were returned to owner. The other robbery was up near the corner of Fire Mountain and Ridgeway and the burglars came through the window while the owner was sleeping. Please be careful and aware while you are home and away and be sure to watch out for your neighbors as well. Other important numbers in Oceanside can be found here. 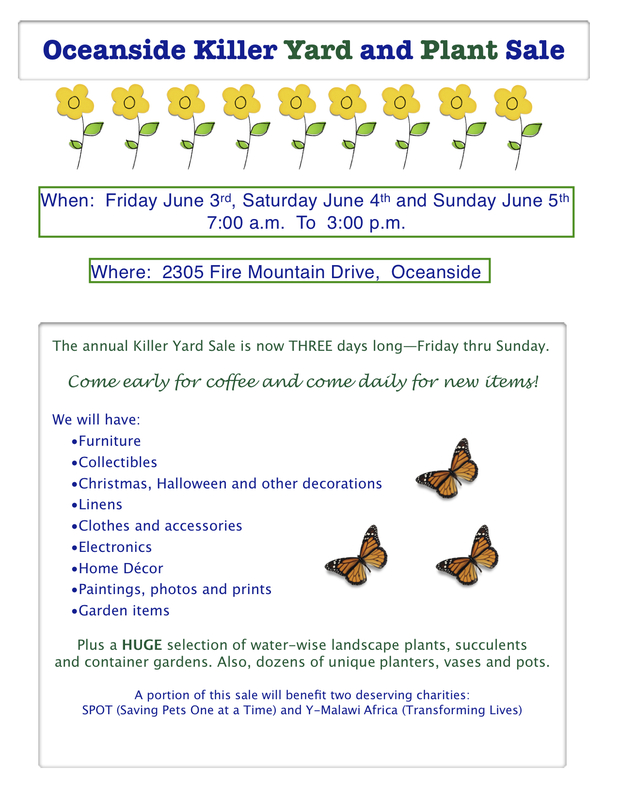 Oceanside’s Killer Yard & Plant Sale is Back! If you haven’t been to the California Surf Museum, you are missing out on a beautiful and important part of Oceanside (and California) culture. The museum is celebrating 25 years in the community with it’s 4th annual Gala Fundraiser Saturday, June 11, 2011 from 5-10 pm. With live entertainment by John Hull, silent and live auctions and tasty food and drinks it’s sure to be a groovy time! Categories: History, Meetings and Events | Permalink.